There are just too many things that need to be said to incorporate this into another thread, so I apologise at the outset. I started writing this before the sacking. I think we can all agree that the second half on Saturday was one of the most pitiful spectacles ever witnessed at Bescot, and that statement doesn’t come lightly in our pantheon of ineptitudes. The whole club is an utter shambles from the top (of course) down. So, let’s consider Saturday’s events. Firstly, a set of keys were lost for the away fans parking*. Surely the club would have a spare set. Surely the club would have known that there were thousands of away fans coming. But that’s not all. The lack of control over the subsequent arrival of said away fans at the club led to a free for all including the occupation of disabled spaces and other non-permitted parking. The exit arrangements ensued likewise and appear to have been totally unsupervised. An incident will occur on the club’s land one day. This might seem minor to some, but disabled fans were rightly outraged. You don’t need to go too far into the news to see how crowd control or the lack of it can escalate into a far more serious situation. The home parking is staffed by utter buffoons*, who I wouldn’t trust to run a bath let alone such a potentially serious safety and financial matter. Also bear in mind that the FA would soon drop us from the assorted England matches we enjoy. The club always appear to be totally mystified when more than 4,000 fans turn up for a game and simply cannot cope. The idea of gaining some advantage by taking the trouble to phone in advance and collect from the ticket office is nil. Only buying a ticket some weeks in advance spares anyone. The staff are mostly pleasant but hopelessly inadequate for the task. Alternative arrangements must be made. Consider the parking debacle described above and how this lack of control leads to a potentially serious safety concern. At one point, I saw three young ladies of assorted ethnicities attempting to procure tickets. Such was the utterly confusing nature of the system, I would be surprised if they were in their seats by kick off. This first sentence might seem tasteless to some, but I guarantee that all 92 professional clubs and the FA would cream their drawers at attracting these sorts of supporters. One can only imagine their match day experience and the likelihood of them returning. I wonder what a similar experience would be for them at another club in the area. I just need to re-iterate that only one man runs it and his directors are utterly subservient. Their presence is totally irrelevant other than to satisfy Company Law and the like. Lip service is given to supporters, using the said directors to do his dirty work, interfacing with fans and the media. The catering is minimal and staffed by similar sorts to the parking arrangements. I can only assume the hospitality is somewhat different, I’ve never been. However, the EFL keep having meetings in the suite. The toilets do function correctly I hear, which is an improvement. The painting of the stadium cladding is exactly the sort of papering over cracks mentality that comes from the top. This might not seem so serious, but consider the way the manager has paid for the recent results. None of the backroom staff have shared the blame. From usual form I can only assume it would cost too much to pay them all off. This stops us getting any ambitious manager in who might want to do things his own way. Good old Martin O’Connor for offering to help for 5 matches, I say. Tied in with this is the matter of media relations. It has been proved lately that nobody can be bothered or dares to examine beyond the club’s own narrative. Whilst it makes a small profit every year, nobody examines how this has come about and the media idly regurgitate the ‘well run club’ mantra. I don’t know how we can change this, but our thick fans playing into Franksy’s hands is taking us backwards. Each phone call like this cements Jeff’s position. We have five matches to keep ourselves in the division. To be in this position from being in the playoffs in opening weeks is absolutely baffling. Saturday’s second half performance was quite unbelievable to the point where I wondered why the players were unable to comprehend the significance of the spherical object. This can only come from the coaching staff and the players have gone backwards this year. The defence and goalkeeper are nice lads and try really hard, they’re just prone to individual errors, collectively disorganised and can’t pass very well. This is a bit of snag for defenders really. Norman and Laird have added nothing other than basic cover and Purkiss hasn’t even got a squad number to my knowledge. The midfielders are good but Keates persisted in playing the liability that is Osbourne to his eventual cost. Chambers can deservedly go out to stud. The wide players have been hilariously erratic. Wide players are erratic by nature and we can’t expect too much, but this is beyond a joke. Ismail is rarely interested, as was Morris. Jarvis is more interested in Twitter and pretending he still lives in the glory days. Blackett-Taylor refuses or is too thick to play wide. Ginnelly was the star* performer and can’t get near Preston’s team. Again, the forwards are good but they are not getting good service. Cook is going mad at the deliveries into him with justification. People saying that the team plays better without him are completely missing the point. Gordon is a tireless worker feeding off scraps and has been the find of the season. Ferrier has flashes of brilliance and would make a good impact player. Oteh is a waste of time and we might as well have played our own boys. Keates has been allowed to get two players for every position, completely overlooking the crop of talented youngsters who have been allowed to stagnate due to the urgency of the mess he has got us in. It doesn’t take Einstein to imagine that Jeff was only going to stand this mess for so long. The only positive of D4 football is that some of the young lads might come in and do well. Jeff can trouser some more cash hopefully. Solihull should be an interesting local derby. Especially if Coventry are tenants. Apart from the Chairman, obviously. It’s been established before that they pay less than the minimum wage. If the club treats them as sub-human, why should we think any differently? Mostly. All the clever ones don’t bother anymore. A Pension Fund, which just happens to bear his name. My opinion, but I doubt I’m wrong. Not a Scottish pop duo. AFKALS I applaud and salute you sir, a brilliant summary of everything that is wrong at this club. Amateurs running this football club that serve only to penny pinch at every opportunity, I mistakenly believed that dinosaurs had become extinct but realise they are well and truly alive and thriving in the boardroom of Bonser Pension Fund FC. I would thoroughly recommend a read of this book. It’s quite old now but the principles of it still ring true. 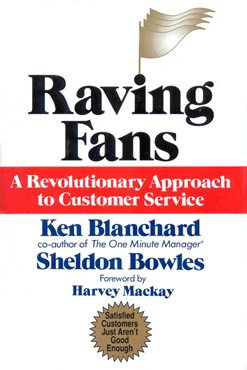 Not rocket science but some insightful examples of how to provide brilliant customer service. Thank you. I was just having a moan, really. But perhaps I need to up my game. Has anyone sent a copy of that to the club? Sorely tempted to. Maybe you could provide text for covering letter? I don’t mind if people want it sending? I was talking about the book?